Mud. I’ve had the pleasure of being stuck in it as well as having it smeared all over my body. Both experiences proved to be quite the adventures, and, upon reflection, they give me ample metaphor for the nature of my day-to-day life on two very different continents. In June 2013 I moved to Liberia, West Africa, following a dream that began in 2008 when I first flew over the mother continent and began my humanitarian work there. Liberia drew me in as no other place had before nor since. People still ask me why, and I still find it difficult to explain. After all, it’s quite insane in most people’s perspectives to leave a cush existence in the US ( I was living in Dallas, Texas, at the time) to live in what at the time was called “the second-poorest nation on earth” and deemed the most corrupt by international activist groups. And I went not only willingly, but excitedly, from posh restaurants with the freshest ingredients, acres of shopping malls, movie houses that served drinks and food as we sat back on a comfy recliner, neighborhoods where the biggest excitement was when a streetlamp burned out, to urine-stained walls, barbed wire bordering every public and private building, streets unsafe to walk alone at night, and beggars—often without arms or legs (former child soldiers and victims of a heinous fifteen-year civil war)—waiting to rush me as I exited the supermarket. But what I quickly came to understand was that Liberia grew my heart. What I witnessed in the most gorgeous smiles I’ve ever encountered on all the planet—smiles that shine brightly despite intense and immense heartbreak and loss—and hearing real stories of the forgiveness that had to take place between neighbors on opposite sides of the civil war who were either victims or perpetrators of horrible crimes, changed me forever. When I couldn’t run from poverty like I could in the US, I had to find a way to see the beauty around me or go mad. You know what I’m talking about, don’t you? It’s like when you are fortunate enough not to live in a bad neighborhood or a ghetto in the US, but you may have the occasion of driving through one sometimes, at night, with the gas tank nearly empty, sighing with relief when you are on the other side of it. You step a toe in, but you know you don’t have to stay there. You may even work or go to school in a neighborhood like that, as I did when I went to college in downtown Los Angeles, but when you go home, you’re surrounded by all that gives you a sense of beauty and safety. In Liberia, even though I was fortunate to live in two great neighborhoods during that year, there was no escaping what I describe here, except perhaps once I was inside my compound. Having a dog, I got to walk outside my compound at least four times a day, and as nice as my neighborhood was, I could not ever escape a person lying on the sidewalk, sick; a woman who had lost her mind walking naked down the street, with no social services to turn to; trash stuck in the bushes; war-ruined homes with no roofs next to newly built mansions; graffiti-lined walls warning, “No pee pee here”; a young man approaching me with a plea of, “mommie, you have work for me?”; dirty streets; and oh, yes, mud. During the rainy season there is mud, and lots of it, as even the paved streets outside the main parts of Monrovia, the capital, are often lined with mud banks that roll onto the pavement. And because drainage is an issue, streets flooding from mud-filled lots is the way it is in most neighborhoods. So looking for and seeing beauty in the people, my surroundings, and the Liberian way of life became my greatest gift; my yoga, my practice. Not everyone who is there, whether by birth or by choice (like me), sees Liberia the way I do nor assumes the practice I took on. I met with many who didn’t, even lived with someone who didn’t. There is an expression: the more you can feel your deepest sorrow and pain, the more you can feel your deepest love and joy. So I learned to let the reality around me move me emotionally and inform me of a higher truth that perhaps just needed a magnifying glass to be revealed in its entirety. Here is an example of what I’m talking about, an example of my yoga in Liberia. Well, on this day, this lady said, “I’m not feeling well. I have such a pounding in my head.” And she looked visibly tired and weak, not her usual cheerful self. And then it came. “Do you have any medicine you can give to me?” I told her I did not, and I felt an urge inside me to dig deeper and not just walk away. I asked myself, “What is the higher truth and beauty that can be expressed?” So instead of just walking by, I stopped and said, “I have a pretty powerful connection with the angels and God; do you believe in angels?” She nodded yes. “I believe in prayer, and I’m going to pray for you and with you right now and all afternoon that you feel better and are well; and the thing is that if we both believe it, it has to be true because that is the Law—it is the way it is—and I know this for a fact!” She smiled and said, “Okay, thank you. Oh, I hope I will feel better.” We prayed together, then I left and did as I promised. For the next two hours I prayed for her to be rid of her illness. Then, when I met with her two hours later on my next walk with Barnaby, I saw her jumping up to greet me with both hands clapping and smiling her gorgeous, big, white, toothy smile! “I am well! Praise God! It’s a miracle. You prayed for me and I am better. I did not need any medicine! Thank you. 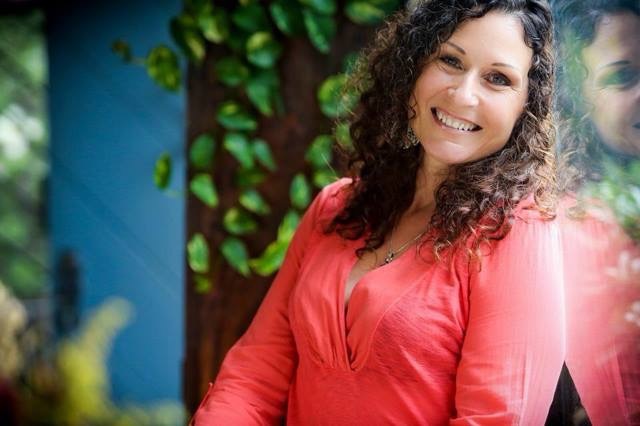 God bless you!” So I got to share a deeper moment of love and joy with a fellow human being because I refused to shut down my heart; in fact, I sought ways for it to expand. But I wanted to tell you about mud and how I got stuck in it, and how that, too, became my yoga in Liberia. It is always when you can’t afford to be stuck or delayed that it happens, isn’t that true? 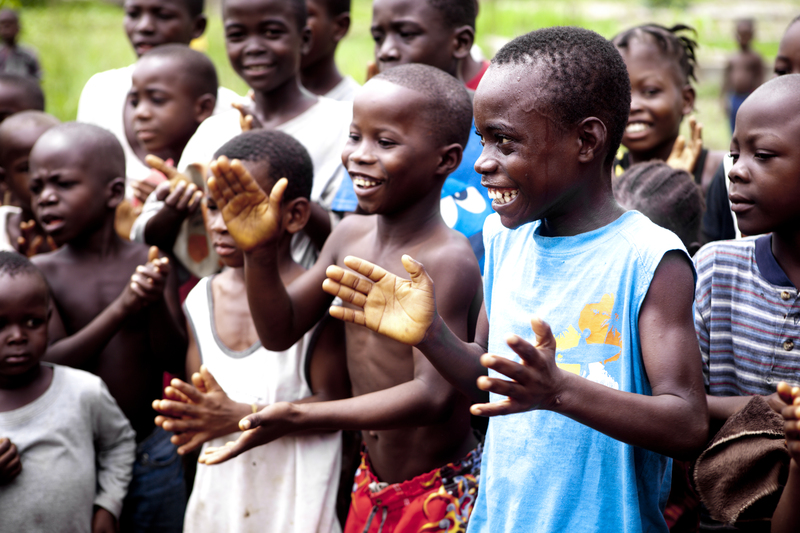 The experience of getting stuck in the mud in Liberia reinforced the idea that “there is always a way if you go the way together,” because being stuck in the mud is just a way of life in Liberia; it is not a once-in-a-while occasion, and it is nearly impossible to get out of it by yourself. I have been stuck in the mud at the airport while waiting for my tour group to arrive when complete strangers walking by stopped and pushed the van out of the mud and, without a word, walked on. I’ve been stuck in a van full of tour participants when about fifty school children took off their shoes and socks, rolled up their pant legs, and entered the mud to get us unstuck. Stuck more times than I can count; and eventually . . . unstuck. 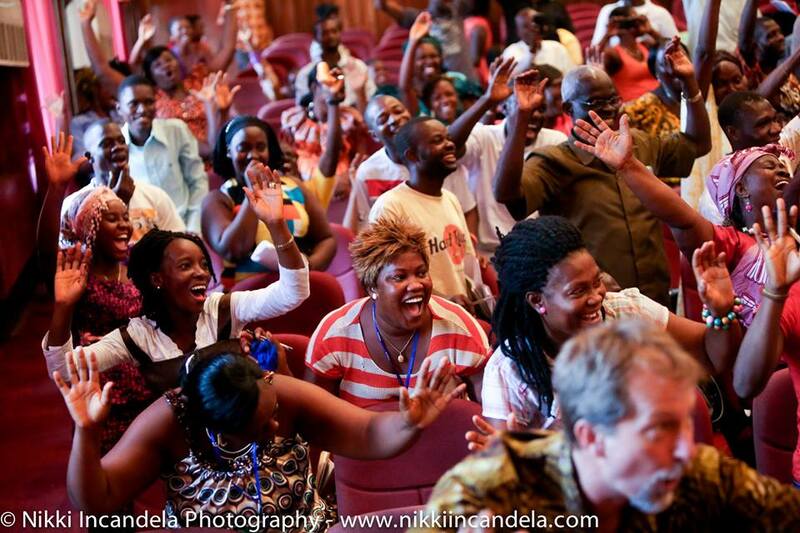 The power of community, faith, digging deeper—this is the daily practice, my yoga, of Liberia. In Liberia, I did everything I could to avoid the mud. Now, in Ecuador, I can’t wait to be in it! I first came to Ecuador in November 2012 when I led a tour group of forty participants. On my third day in the country, I got spiritual bump (you know it if you’ve ever felt it—when the goosebumps come for no apparent reason, along with a feeling or a knowingness). And I felt it: Ecuador was going to be my home. I know now that I was being called home by what feels like my spiritual ancestors. Where it was the strength of the people of Liberia that compelled me to leave my home in the US to learn from them and to serve them, in Ecuador it is the land itself that drew me in—the earth, the mud. 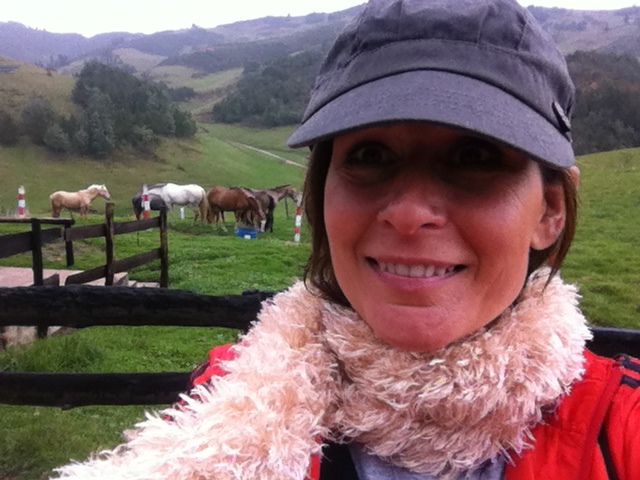 Within days of arriving, I was on a horse (my spirit animal and Chinese zodiac sign), galloping over the red earth, my horse kicking up red mud, and, somewhere along the journey, mesmerized by the beauty of the Andes Mountains and hypnotized by something in the air, I automatically let go of my reigns just as my horse jumped across a small gulley. Ooofff I went, up in the air, over the back of the horse, landing right on my tush! Gratefully, he was a well-trained horse. He just stood still, not flinching a muscle and not backing up, so that I could right myself and get back on. Instead of feeling upset, I was exhilarated and laughed out loud, quite uncontrollably, saying, “I fell off my horse in Ecuador! How awesome is that?” Maybe I was delirious from the fall, or maybe I was spiritually bumped. I prefer the latter. Suddenly, as I looked around me, everything was crisper and clearer, and the feeling of this being my home began growing in me. Just a few days later, I was on our quiet tour bus early one morning, and all the participants were quietly resting. As we climbed up to 14,000 feet through the clouds and fog, I heard a voice in my left ear, clear as day: “Your true love is coming; in fact, he’s closer than you think.” I actually turned my head to make sure it wasn’t someone from the seat behind me saying that. There was no one sitting beside me, and those behind me looked asleep. Just then I felt an urge to look out the window to my left, where I saw a perfectly round hole through the clouds and fog making a large tunnel up to the crystal-clear blue sky, and I could hear the song playing in my head, “I can see clearly now the rain is gone . . . ,” and I started laughing uncontrollably once again. So now I live in the Andes of Ecuador. Sadly, I needed to pack my suitcases, grab my boy Barnaby, and leave Liberia four months ago because of the Ebola crisis. But before I even got here, I could feel the laughter that was waiting for me. It echoes to me through the wind and yes, in the mud. Just the other day I actually went bathing in the mud at Piedra de Agua (which means “Stone of Water”), a hot springs spa formed into the earth, rocks, and mud of the Andes. I grabbed a big handful of red earth and smeared it on my arms and chest, grabbed another handful to smear on my legs, front and back, then my neck, upper back, and shoulders, and finally, a clump for my neck and face and up into my hairline, covering every inch I could. I stopped then and looked at myself in the big mirror standing in front of the mud pool—and, along with all the other red-lathered, layered Mud People near the pool, laughed uncontrollably. Laughter. Now my daily practice, my yoga . . . in Ecuador. And what of my “true love coming,” as was whispered in my ear, you wonder? Yes, yes, it’s true; it happened, indeed. But that’s for another story. Stayed tuned. Wow!!! MammaCarm! I am so thrilled really beyond words for you ….and him!!!! You are both very lucky, blessed and kissed by angels to have found each other – and I am so sure Frank is smiling at your incredible adventurous life that keeps unfolding thru healing and grieving to miracles abounding. I LOVE you so much – you are just such an inspiration to me. Pls lmk any time you head to Ecuador on your travels. I love you and if you want to do a Skype catch up lmk. Thankyou Jan! I love love love love YOU!! Thankyou – you’ll come here and be my MUDSISTA! what fun! Love your blog as well and look forward to our amazing travel adventures! Thank you for your fabulous editing – muah!